Received the following via email. Dahlman Rose Annual Global Transportation Conference, Sept. 9 at 10:45 a.m. EDT. Interested investors may listen to a simultaneous webcast at http://www.wsw.com/webcast/dahlman3/nsc/. After the webcasts, each presentation will be posted at www.nscorp.com. Norfolk Southern Corporation (NYSE: NSC) is one of the nation's premier transportation companies. 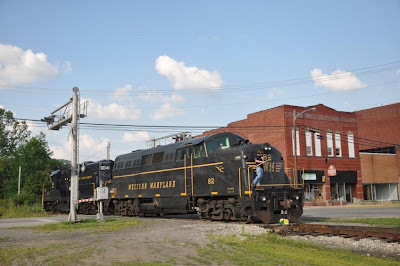 Its Norfolk Southern Railway subsidiary operates approximately 21,000 route miles in 22 states and the District of Columbia, serves every major container port in the eastern United States, and provides efficient connections to other rail carriers. Norfolk Southern operates the most extensive intermodal network in the East and is a major transporter of coal and industrial products. There is an interesting report available on the web that is "A Weekly Report of North American Rail Freight Traffic by Major Railroad and Commodity." It is currently showing data for week 33 of 2009. Here is an example of the information available on this web site. This graph shows Total Traffic for 2008-2009 vs. 2007-2008. There are more graphs and tables on the web site showing data by railroad and by commodity. Note: This web site has new tables and graphs every Thursday. So, if I am late or miss a week with this blog posting, you can check for new data on Thursdays. CSXT's Logan Sub. The line that time forgot. Received the following via email from Kermit Geary, Jr. Text, photos, and captions are his. The CSXT's Logan Sub is a step back in time. 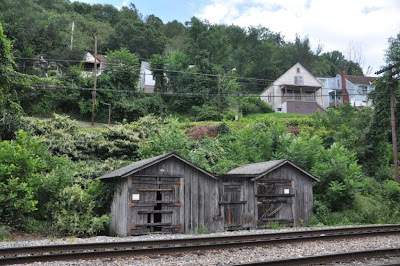 Many old buildings still exist as well as old style C&O signals. One almost expects to even find an old speeder in those motor car sheds! Received the following via email from Kermit Geary, Jr. Text, photos, and captions are his. 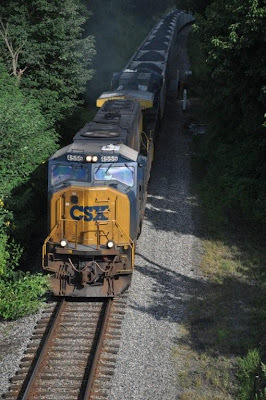 In this series of photos he follows a northbound train on CSXT's Logan sub. 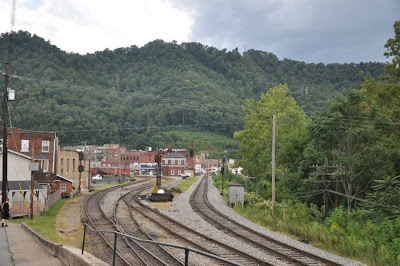 He starts in Peach Creek, WV, which is just north of Logan in southwest WV. 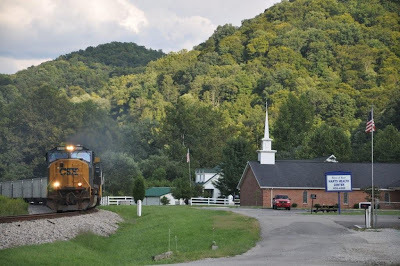 He then follows the train north along WV Route 10 to Barboursville, which is just east of Huntington. Spent a great weekend in Charleston WV visiting with some good friends including one who had the misfortune of spending a week in the local hospital. Thankfully he is now well and he is out and resuming railfan activities!! Nick, you are still in our thoughts for a continued recovery. 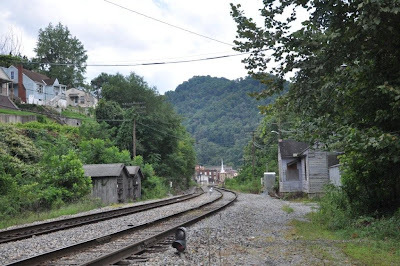 Mike & Chase took Troy & me out following various coal lines in the mountains south of the St Albans, WV area. 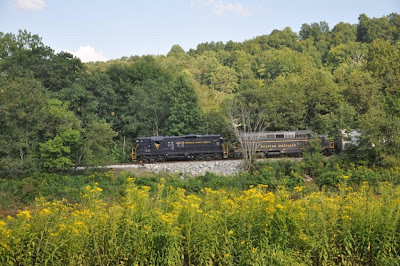 Came across a westbound leaving Peach Creek, WV and had a great chase up to Barboursville, WV on the Logan Sub. 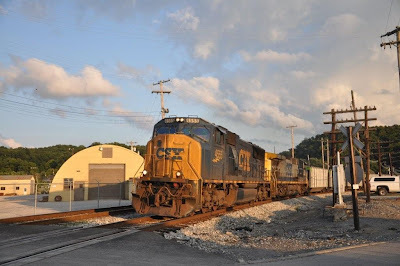 After the CSXT / A&O chase, went over to the West Virginia Central's operation at Belington, WV and found the Elkin train arriving with the BL-2 and a GP-9. Hope you enjoy! Back on the road again!! Received the following from Kermit Geary Jr. Text, photos, and captions are his. It has been awhile since I have sent anything out. Think the last was on the way to Owosso, MI and the big steam-fest there....That was not a good trip for the digital camera! After losing a days images due to a corrupt chip, the AF decided to fail on the lens...tried to use the focus manually to some degree of success, but most of the images were consigned to the electron junque pile. The trip back was also good, with a nice chase of 3 big six-axle MLW's on the WNYP Driftwood Turn. THANK GOODNESS for KODACHROME!!!! going to have to wait till I can scan the images onto the computer!!!! Bit the bullet and took the big plunge and bought myself a NIKON D-90. Spent some time getting used to it and finally feel confident in showing off some of the images taken with the new toy! 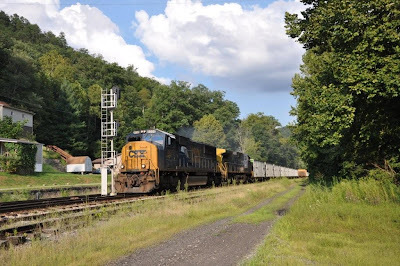 This segment is of a empty hopper train on the Appalachian & Ohio (ex B&O) line from Grafton to the Evergreen loadout at Cowen, WV with run-through CSXT power. There is an interesting report available on the web that is "A Weekly Report of North American Rail Freight Traffic by Major Railroad and Commodity." It is currently showing data for week 32 of 2009. Received the following pictures via email. Note: Click on a picture to see it enlarged. Then use your browser's Back button to return to the blog. Museum in or near Cleveland, OH. Note the rail car on the right behind this sign. 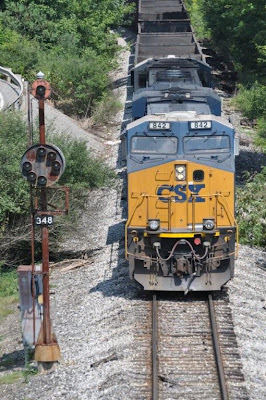 ALTOONA, PA. - The Norfolk Southern Foundation has given $100,000 to Penn State Altoona to assist in the development of a four-year Rail and Transit Engineering (RTE) degree program. This innovative Bachelor of Science program will include existing Penn State civil engineering courses, coupled with new customized courses in rail business, mechanical systems, track, operations, communications, and regulation. The program is designed to produce graduates who will quickly acclimate to the rail industry and its suppliers. "On behalf of the entire Penn State Altoona community, I express heartfelt appreciation to Norfolk Southern for the vital role it is playing in the creation of this exciting academic initiative," said Dr. Lori J. Bechtel-Wherry, chancellor of Penn State Altoona. "We are proud to be a national leader in this discipline. The railway industry has an established history of philanthropic support at Penn State Altoona. As an institution committed to public service, our college draws inspiration from Norfolk Southern's community spirit, and we are grateful for the railroad's support of our vision and their partnering with us to enhance academic and career opportunities for our students." Cindy Earhart, Norfolk Southern's vice president human resources, said: "While the rail industry is operating in challenging economic times, the fact remains that our workforce is maturing. In order for Norfolk Southern to remain successful, we need to develop a talent pool that understands the railroad work environment. Penn State Altoona's Rail and Transit Engineering program will provide the industry with skilled and motivated graduates who want to become the next generation of railroaders." "I want to congratulate Norfolk Southern and Penn State University for coming together to create this fantastic baccalaureate program in railroad engineering," said Congressman Bill Shuster, Ranking Republican on the Subcommittee on Railroads in the House of Representatives. "Pennsylvania played an important role in building America's railroads, and our state continues its proud heritage to this day. The transportation of goods and services over rail is critical to our economic growth and educational programs like this at Penn State will help improve its role across the country. I want to recognize Norfolk Southern for its commitment to improving the communities it works with and I congratulate Penn State and its students on this exciting new educational opportunity." "As a proponent of the Rail and Transit Engineering degree program for the past ten years, this truly is a dream come true," said State Rep. Rick Geist. "It took bringing the right people to the table to create this win-win development for Penn State Altoona, Norfolk Southern and all of Blair County and we certainly have the right people. A Rail and Transit Engineering degree program is evidence of railroading's bright future and will usher in a new and exciting era." 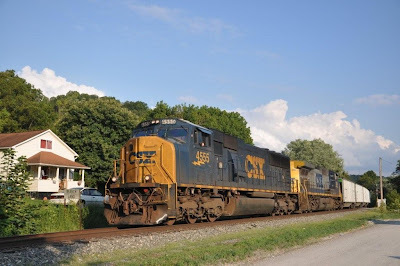 Penn State Altoona is an ideal site for the new program, given its geographic location to Norfolk Southern's primary locomotive maintenance facility and the railroad's main artery between the Chicago and New York markets. 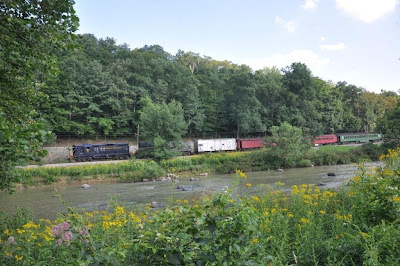 Founded as a rail center in 1849 by the Pennsylvania Railroad, Altoona is world-famous for its long history as a leading site for steam and diesel locomotive repair and maintenance, and its landmark of rail engineering, the Horseshoe Curve. 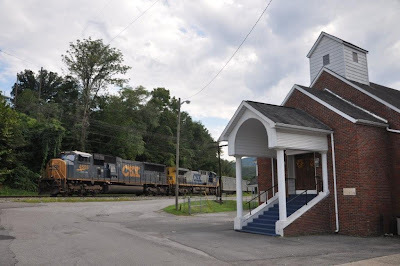 Another component of the Penn State RTE program is the Altoona Railroader's Memorial Museum, which is dedicated to revealing, interpreting, commemorating and celebrating the significant contributions of railroaders and their families to American life and industry. 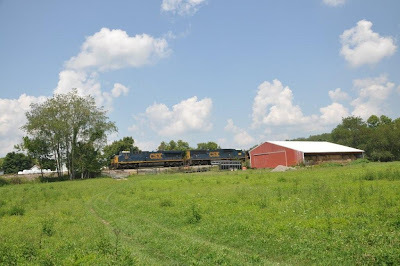 The museum has close relationship with Norfolk Southern and has offered the Penn State program space in a new roundhouse planned for the museum property. Pending approval by Penn State University's faculty senate and administration, it is anticipated that classes in the RTE program will begin at Penn State Altoona in the fall of 2010. Norfolk Southern will provide the program with technical support and assistance. Bechtel-Wherry described the program as "a groundbreaking academic initiative that will provide students with a unique multidisciplinary experience." 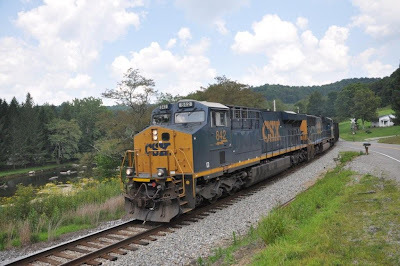 "It is entirely fitting that Penn State Altoona - located only minutes from the hub of Norfolk Southern's local operations - will offer this particular program," she said. "The potential impact of this program on the railroad industry is substantial. Through our Rail and Transit Engineering baccalaureate degree program, we have the opportunity to play a vital role in training engineers for placement within the expanding railroad industry. The potential benefits of this program for our students, our college, and the railroad industry are limitless." Norfolk Southern and Penn State have also engaged in joint research to improve the energy efficiency of locomotives and reduce railroad emissions. Funded by NS and the U.S. Department of Energy, this effort will encourage students to get involved in developing new and innovative technologies for the railroad. Norfolk Southern Corporation (NYSE: NSC) is one of the nation's premier transportation companies. Its Norfolk Southern Railway subsidiary operates approximately 21,000 route miles in 22 states and the District of Columbia, serves every major container port in the eastern United States, and provides superior connections to western rail carriers. Norfolk Southern operates the most extensive intermodal network in the East and is North America's largest rail carrier of metals and automotive products. There is an interesting report available on the web that is "A Weekly Report of North American Rail Freight Traffic by Major Railroad and Commodity." It is currently showing data for week 31 of 2009. NS to construct a new intermodal terminal in Greencastle, Pa.
NORFOLK, VA. - Norfolk Southern announced today that it will construct a new intermodal terminal in Greencastle, Pa., to serve the Mid-Atlantic region, as part of the railroad's multi-state Crescent Corridor initiative to establish a high-speed intermodal freight rail route between the Gulf Coast and the Northeast. The $95 million facility, at which freight moving in containers and trailers will be transferred between train and truck, will occupy a 200-acre site adjacent to the planned Antrim Commons Business Park and is expected to open in late 2011. "Because of its strategic location to key markets in the Mid-Atlantic region, the new Franklin County terminal is vital to the success of our Crescent Corridor," said Wick Moorman, Norfolk Southern's chief executive officer. "We commend Gov. Ed Rendell for his efforts to provide state funding for our intermodal terminal initiatives in Greencastle and Philadelphia. We also want to thank Sens. Robert Casey and Arlen Specter, and Rep. Bill Shuster for their support of a public-private partnership with the U.S. Dept. of Transportation so that Pennsylvania will benefit from the economic development opportunities and job growth potential of integrated logistics hubs. We also want to express our gratitude to the rest of the Pennsylvania and Maryland members of Congress who are supporting the Crescent Corridor, including Roscoe Bartlett, Bob Brady, Charlie Dent, Jim Gerlach, Tim Holden, Patrick Murphy, and Todd Platts. Finally, we must recognize the Pennsylvania Department of Transportation and the Franklin County Area Development Corporation for their tremendous support in moving this project forward." "Rail freight is an important component of any transportation infrastructure discussion," Governor Edward G. Rendell said. "This facility will create good jobs, generate revenue, and help reduce highway congestion. Pennsylvania has invested heavily in rail freight because it is a smart, environmentally friendly, cost-effective infrastructure investment. I will continue to advocate for rail freight investments at the state and national level." Norfolk Southern's Crescent Corridor initiative is a multistate network of infrastructure improvements and other facilities intended to enhance Norfolk Southern's 2,500-mile rail network that supports the supply chain from the Gulf Coast and Memphis to Harrisburg, Philadelphia and the New York metropolitan area and enable it to handle more freight traffic faster and more reliably. The railroad is in the process of implementing Corridor projects, including straightening curves, adding passing tracks, improving signal systems, and building new terminals. Altogether, nearly $2.5 billion in Crescent Corridor projects have been identified, and based on the public benefits that stand to be derived in the form of highway congestion relief, NS plans to implement the Crescent Corridor initiative through a series of public-private partnerships. When the Crescent Corridor initiative is fully implemented, it is anticipated that more than one million truckloads of freight will be absorbed from the highways to the rails annually, saving the U.S. more than 170 million gallons of fuel per year. 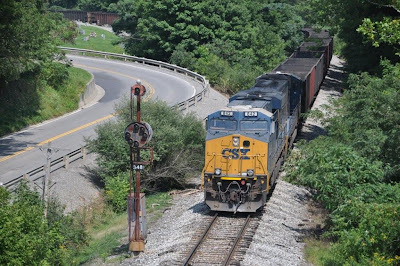 When the Crescent Corridor is fully operational, annual benefits to Pennsylvania are expected to include nearly 700,000 long-haul trucks diverted to rail, almost 10 million gallons of fuel saved, carbon dioxide reduction of 110,000 tons, more than $9 million in traffic congestion savings, and avoidance of an estimated $8.5 million in accident costs. Over the next ten years 26,000 jobs in Pennsylvania are expected to be created or enhanced by the Crescent Corridor. Norfolk Southern also has improvements planned for existing intermodal terminals in Harrisburg and Philadelphia, along with $27 million in track and signal upgrades. The proposed investment in the Franklin County Regional Intermodal Facility will create the capacity to handle more than 85,000 containers and trailers annually. The terminal will utilize the latest in gate and terminal automation technology, which shortens the waiting time for trucks entering the terminal, thereby reducing exhaust emissions and improving truck driver productivity. Four intermodal trains daily will serve the terminal. Site selection was given careful and exhaustive consideration to minimize impacts on surrounding communities, roadway facilities, and the environment. A site near an existing logistics park with quick access to an interstate highway was chosen so that national and local markets would have the opportunity to benefit from the Crescent Corridor's state-of-the-art economic development and environmental potential. Rail Intermodal traffic uses one-third of the fuel required by long-haul trucks and greatly reduces highway congestion, greenhouse gas emissions, and highway maintenance costs. The Crescent Corridor will help the environment and reduce a large burden on state budgets. Norfolk Southern Corporation (NYSE: NSC) is a leading North American transportation provider. Its Norfolk Southern Railway subsidiary operates approximately 21,000 route miles in 22 states and the District of Columbia, serves every major container port in the eastern United States, and provides efficient connections to other rail carriers. Norfolk Southern operates the most extensive intermodal network in the East and is a major transporter of coal and industrial products. Any statements contained in this news release which are not related to historical facts are forward-looking statements as that term is defined in the Private Securities Reform Act of 1995. Such forward-looking statements are subject to risks and uncertainties (noted in the corporation's filings with the SEC) which could cause actual results to differ materially. There is an interesting report available on the web that is "A Weekly Report of North American Rail Freight Traffic by Major Railroad and Commodity." It is currently showing data for week 29 of 2009. From the graph, it looks like rail traffic is picking up. But is this just a seasonal effect, or is this a sign of economic recovery. Keep watching this blog for weekly updates. Over a year ago I posted still pictures of a backhoe climbing on top of a hopper car. (M of W Procedures, April 16, 2008) I have now come across a video of these backhoes in action. It is a marketing video from Herzog, the company that supplies these specially equipped machines which they call "Cartoppers." NS 18G @ 8:40 with NS 9699 as its leader along with an unidentifed second NS unit bringing its general merchandise freight east on track 2. NS 22V @ 8:50 with NS 9798 and NS 9946 with its colorful consist of COFCs. NS 214 (time not recorded) had NS 2656, NS 2564 and NS 9449. NS 212 (time once again not recorded) would have NS 9495, NS 2765 and NS 2637. NS 11J- after holding at the waterworks for these four eastbounders, NS 9971 and NS 9821 was on the move west with its empty autoracks. NS 21M @ 9:50 would have NS 9143 as its leader.